King Kong (1933) is one of the 1001 classic movies you should see. Each Monday, I'm going to recommend a classic movie you should see (for the reasons behind the 1001 series and reviews of earlier films covered go here). The new film, Kong: Skull Island (2017) has brought the monkey movie back into the spotlight, so with that in mind our March theme is Going Ape in Old Hollywood. Appropriately, this week's movie is the original version of King Kong (1933). King Kong tells the story of Hollywood filmmaker Carl Denham (Robert Armstrong), who sets off to make a movie in a mysterious place known as Skull Island. The inhabitants there worship a legendary entity called Kong, although no one knows exactly who or what it is. When Denham and his cast and crew arrive on Skull Island, the natives quickly kidnap leading lady Ann Darrow (Fay Wray) to be Kong's bride. Denham and a search party go out to rescue Ann, but they encounter a land filled with dinosaurs, sea monsters, and, most frightening of all, Kong himself. King Kong was the brainchild of producer Merian C. Cooper, who came up with the idea for a giant ape movie while shooting location footage for The Four Feathers (1929) in Africa. Paramount Pictures turned Cooper down, but RKO Pictures producer David O. Selznick was intrigued by the idea. He eventually persuaded RKO to hire Cooper and brought in famed adventure author Edgar Wallace to write the first draft of the script. The result was an unprecedented box-office triumph that made even more money in subsequent re-releases. King Kong has since become one of the most influential films of all time, inspiring everything from the fifties craze for stop-motion animation to director Peter Jackson's The Lord of the Rings films. Originally, Cooper wanted to use real apes for King Kong (this was probably the main reason Paramount turned him down), but once he saw special effects genius Willis O'Brien's work on an unfinished movie, Creation (1931), he realized there was a better way to achieve his vision. O'Brien and his assistant Marcel Delgado created several models of the great ape, including a 20-foot-high head and large hand and foot, but what audiences are viewing for most of the film is an 18-inch scale model made of metal, rubber, latex, and rabbit fur. O'Brien and Delgado manipulated the model to achieve a remarkably realistic animal that is still an impressive sight in 2017. Like the best of the Universal Pictures horror monsters, Kong is at once extremely scary and intensely sympathetic, which makes his final fate one of the most poignant moments in all of cinema. 1. Wray. King Kong wouldn't be the same without Wray, who was old Hollywood's original scream queen. The actress gamely endured 20-hour takes, multiple screaming sessions (she later called it her "aria of agonies"), and several dangerous production stunts, while still retaining an affection for the film and her most famous leading man. This link goes to a sweet interview she did with TCM a few years ago. 2. The character of Denham. 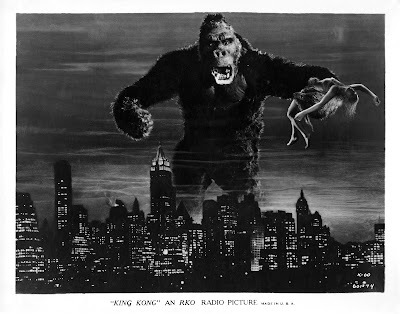 King Kong is so famous as a creature feature that it is often overlooked as a behind the scenes look at old Hollywood. Armstrong's portrayal of Denham as a filmmaker who will blow any budget, tell any lie, and exploit any indigenous person to get the perfect shot is the last word in old Hollywood megalomania. 3. Dinosaurs. King Kong is also the forerunner of dinosaur films like the Jurassic Park series. The prehistoric creatures, which include a stegosaurus, brontosaurus, and pteranodon, were originally intended for an unfinished film called Creation, about dinosaurs living on a remote island. 4. The score. Composer Max Steiner's score for King Kong was a landmark in the use of original symphonic music in old Hollywood movies. Steiner later went on to work on Gone With the Wind (1939) and Casablanca (1943). 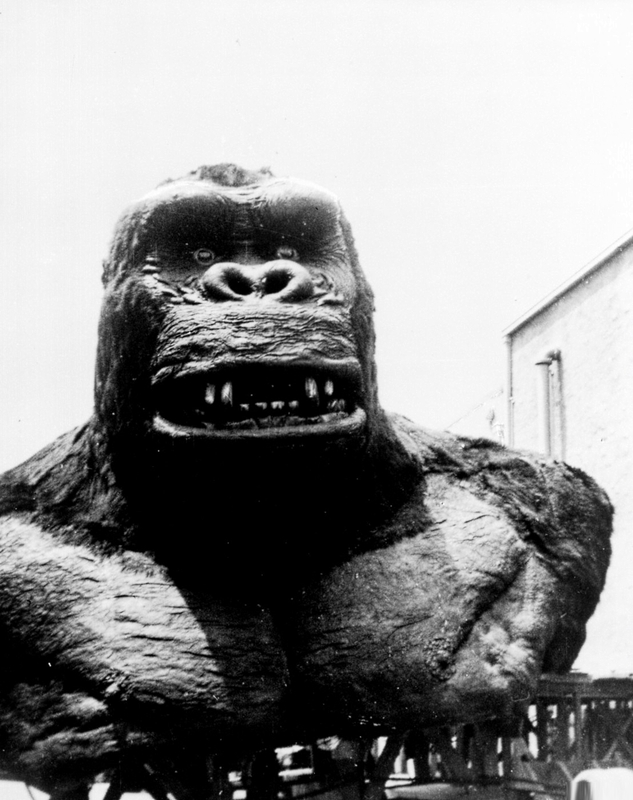 The giant head of King Kong is hauled across the RKO backlot. Other critics: King Kong has a 98 percent fresh rating at Rotten Tomatoes and Leonard Maltin writes that "this classic version of the beauty-and-the-beast theme is a movie-going must" in a four star review for his Classic Movie Guide. Critics in 1933 mostly liked the movie, but didn't recognize it as a cinematic breakthrough. 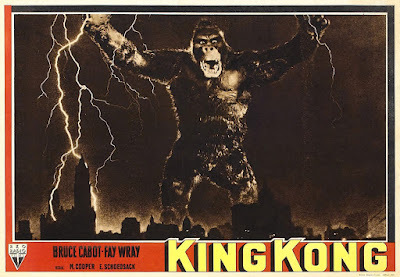 The Variety critic did note that King Kong might lead to "a new medium for scaring babies via the silver screen," but critic James Agate of the London Sunday Times was dismissive calling the film "just amusing nonsense punctuated by such reflections as why, if the natives wanted to keep the monster on the other side of the wall, they should have built a door big enough to let him through." The bottom line: Despite countless remakes, sequels, and spoofs, the original version of King Kong has lost none of its ability to captivate an audience. In today's CGI-dominated atmosphere, it's thrilling to see real three-dimensional figures performing spectacular feats on the silver screen. 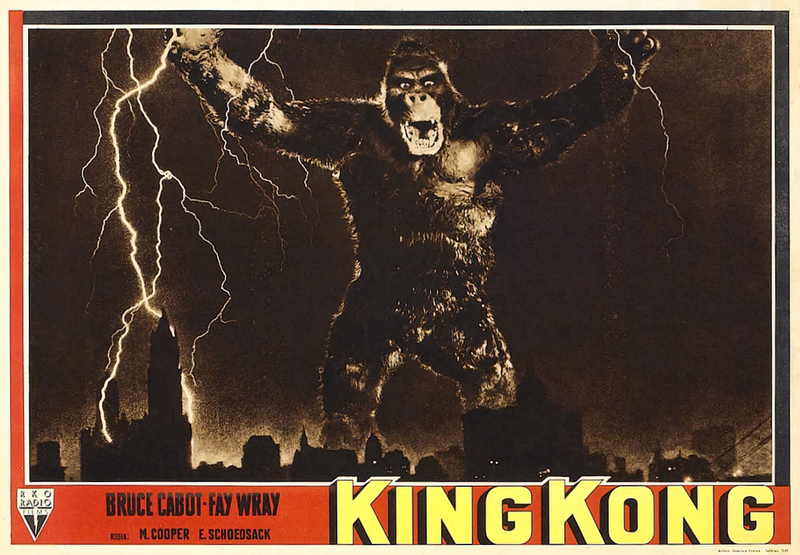 Availability: TCM will air King Kong at 10 p.m. March 23 and 1:15 p.m. April 26. It is also available on Blu ray, DVD, and video on demand. Next week, I'll continue the March theme of Going Ape in Old Hollywood with a gorilla on the loose in the Marx Brothers comedy, At the Circus (1939).